Trees are a beautiful feature of many properties and homes, but what happens if a tree falls on your house, or you get damage to your property from trees? Does insurance cover fallen trees and related damage? It all depends on what the cause of the damage is. Home insurance will cover many forms of damage caused by trees, but may not cover everything. Here's what you can expect from your home insurance if a tree falls on your house and causes damage, or if a tree causes property damage and you want to make a claim. Your home insurance covers certain risks and perils. For example, lightning and windstorm are two common perils. The first step in understanding if your home insurance will cover tree damage is to understand if the damage was sudden and accidental, or if it would be considered gradual damage. Insurance is meant to cover sudden and accidental damage and not gradual damage or home maintenance. An example of sudden and accidental damage would be if a windstorm suddenly uprooted a tree and it came crashing down on your house. An example of gradual damage is when the roots of a tree grow into parts of your home or plumbing. The damage where the roots of the tree have been growing into would not be covered because roots do not grow overnight, this is gradual damage. However, if the damage caused a secondary issue like your pipe bursting and water enters your home suddenly, then you might be covered for the water damage. Different insurance policies have different special limits or policy coverages. Weather-related damage or storm damage is often covered by insurance. If you have an all-risk policy, vs. a named perils policy, your insurance will cover different things. If your tree or home was damaged by a hurricane, learn more about Hurricane and Wind damage specifically. You can also learn more about wind damage and tornadoes. Depending on the cause of the damage, a tree falling on a house may be covered or not. If the tree was healthy and it was not a maintenance issue, then there is a good chance you may have coverage in your homeowner policy. According to the Insurance Information Institute, during a major storm, trees and branches from trees may be flying around and travel significant distances. It may not always be clear who owns the projectile that hit your home or damaged your property. Don't worry about figuring out where the branches or tree came from if you do not know if you have damage call your insurance company and have them help you with your home insurance claim. Anytime you have an insurance claim, you should be prepared to pay the deductible. Often if the cost of damage from the fallen tree is less than the deductible, or close to it, you may decide not to make the claim so that you don't lose a discount on your home insurance policy. In a major claim, if the cost of the damage is very high, there may be a large loss deductible waiver. Finally, if the cause of the damage to your property is the fault of a neighbor, for example, if a neighbors tree fell on your property or home, your insurance company may make you pay the deductible at first but may try and get the deductible back from your neighbor to reimburse you. Learn more about this in the section on subrogation below. Fallen trees not only cause damage to property but also have to be removed once they have fallen after a storm. Most home insurance policies have limited coverage conditions for fallen tree removal. Depending on your policy there may be a maximum dollar limit like $500 or $1000. Your insurance company also may not cover removal of trees if no structure was damaged. Each policy is different so be sure and ask. We talked about the differences between gradual damage and accidental damage above. Many people experience damage to their building structures, pipes, and property from tree roots. A common problem is when the roots of a tree grow into the foundation of a home or the water entry pipe. This damage can be very costly to repair. Always call your insurance company to ask if the damage is covered, because every policy and situation is different. The concept of tree roots growing does not fit the definition of sudden and accidental because roots grow very slowly, so normally damage caused by roots would not be covered. Coverage for replacement of trees following a claim would fall under the landscaping section of your policy. Your home insurance policy may have limitations for damage to trees and shrubs or landscaping. 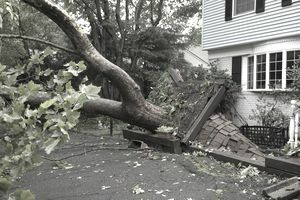 Remember the case we talked about above, where the neighbors tree falls on your house, and your insurance company pays? Insurance companies do this to make your life easy, but they also understand that ultimately someone else may be responsible for the damage. If they feel that a third party like a neighbor is responsible for the damage, then they will take care of you first, but then they will go after the responsible party in what they refer to as subrogation. If they are successful in recovering the costs of the claim in subrogation, then they may be able to reimburse you for the deductible when everything is settled. Is Wildfire Damage Covered by Your Insurance? What Is an All-Risk Insurance Policy? Do You Need One? Will Insurance Pay a Claim For These Different Types of Water Damage? How Much Are Costs of Repairs and Clean Up After Water Damage? What's Really Covered by Your Home Owner's Insurance?